Every industry has its challenges and the dumpster rental business is no different. Consumer demand has its ebbs and flows and sometimes homeowners and businesses find it hard to take on new renovation projects because of economic constraints. Bin There Dump That works hard to offer more than the competition to ensure we’re the first choice, even in difficult times. Recently we sat down with a satisfied homeowner to find out what it was they really liked about our service. What we found shouldn’t have surprised us, but it did – at least a little bit. It turns out this homeowner liked us for all of the reasons we’ve laid down in our mission statement that make us different from other dumpster delivery services. “The delivery was exactly when promised (right on time on the same day as I made a reservation). They protected our driveway just like they said they would. The pickup was also right on time. The communication emails were informative and very timely. The homeowner was having a difficult time deciding on the right size dumpster for their project. That’s understandable and quite common. It isn’t the type of decision the average homeowner has to make every day and it’s a decision they may only make once every five to 10 years. One of our Dumpster Consultants carefully worked them through the decision making process and the customer came away feeling our people on the phone were “awesome” – we love hearing this! Our Dumpster Consultants are trained to answer the phone promptly and to be ready with answers for our clients. They go through extensive training and they’ve all been prepared for every different scenario. For a customer to remain satisfied and actually recommend a service it takes more than a satisfying initial phone call though. That’s where our homeowner’s next bit of feedback was critical. They noted that their delivery was on time and that they got their rental “right on time on the same day as I made a reservation”. This is another important part of our company’s mantra – our Delivery Experts always show up on time, they’re clean and they’re in uniform. They’re the first company representatives that most people ever see. Their appearance and demeanor will leave a lasting impression and, as in this case, determine whether the client will recommend us to others. Another service we consider a basic requirement tends to impress most of our clients. It certainly made this homeowner happy. We always place boards down to protect your driveway from damage, before we lower the dumpster into position. Our client on this occasion expressed a degree of surprise that we offer this service, even though we had made it clear that it was just what we do. This probably has something to do with the fact that many service companies offer all kinds of things and then never follow through. At Bin There Dump That we’ve always believed strongly in follow through. We don’t just say all of the right things, we provide the service we promise. That’s true at all of our franchise locations. This homeowner was happy with our service from start to finish. We not only showed up on time, we left on time as well. That’s important in the case of a homeowner like this. They don’t want a dumpster on their property any longer than necessary. As a business, a satisfied customer is always what you want to hear and consistent customer service is what helps us achieve this. One other thing the client in this case seemed to like was our timely and informative customer service emails. Again, it all comes down to consistency. We believe in maintaining a consistent approach across all communication mediums. It doesn’t matter whether you’re talking to us in person, on the phone, or reading an email. You should always get the same message and level of satisfaction. Residential projects may be our bread and butter, but that doesn’t mean that contractors don’t play a large role in our company. The majority of our best customers are contractors that just happen to specialize in the residential market. Keeping our contract customers satisfied is just as important for the success of Bin There Dump That as keeping homeowners happy is. “I am a water mitigation contractor and have been using dumpster services for over a decade in the Atlanta / metro Atlanta/ North Ga area. I have used every company under the sun from big to small and never have had the experience we did with Bin There Dump That. They were called for the first time on a Friday and they got the dumpster there the same day, driver called with an ETA en route, showed up on time and laid down boards to protect the concrete and even swept up our trash where we missed the dumpster upon picking up the full dumpster. Also, I misjudged the size due to a last minute debris pile that was added to the job and the company was asked to swap me out on a Saturday and I called st 12:00. The dispatcher ran outside and caught a driver that was leaving for the day and had him come back in to swap My bin. We also asked a contractor that had recently used our service for feedback to get a bigger picture of how we’re doing. Their feedback was surprisingly similar to the homeowners and knowing that we’d managed to establish consistency across different market segments was satisfying. Here are some of the highlights from our recent conversation with a contractor. This contractor was a water mitigation contractor in the Atlanta area that had been in business for many years before they began using our service. In fact, he freely admitted to us that he’d tried “every dumpster rental company under the sun from big to small”. After all of his trial and error with other companies, none of them had ever come close to matching the experience he had at Bin There Dump That. In his experience, dumpster rental companies weren’t the best at customer service. He had come to believe that was normal, our Delivery Experts reminded him it wasn’t. The first time he called us was on a Friday – not the typical day to request a dumpster. He didn’t have high expectations. That’s why he was pleasantly surprised when we not only delivered his dumpster the same day, but the Delivery Experts actually called him with updates on route. We were on time and our driver showed up looking clean and fresh. How were we able to accommodate this contractor on such short notice? At Bin There Dump That it’s standard policy to carry additional inventory for last minute contractor requests – most of our locations carry as much as 15% additional inventory. It does add slightly to our overall costs, but we believe we more than make up from it from the number of repeat customers that keep coming back to us because of the timely service we offer. This contractor was happy and surprised with each individual aspect of our service from the time we arrived until the time we left. The fact that we laid boards down to protect their client’s driveway impressed him. The homeowner that hired his company couldn’t care less that we weren’t an actual part of his company. He had made them the promise to treat their property with respect and our delivery experts helped him with this goal. We made him look good and he really appreciated that. He also expressed surprise at what our Delivery Experts did when they picked up the dumpster. They could have just lifted the dumpster from the driveway and removed the protective boards underneath. Instead, they swept up any debris that his workers had missed as they were placing waste material in the dumpster. 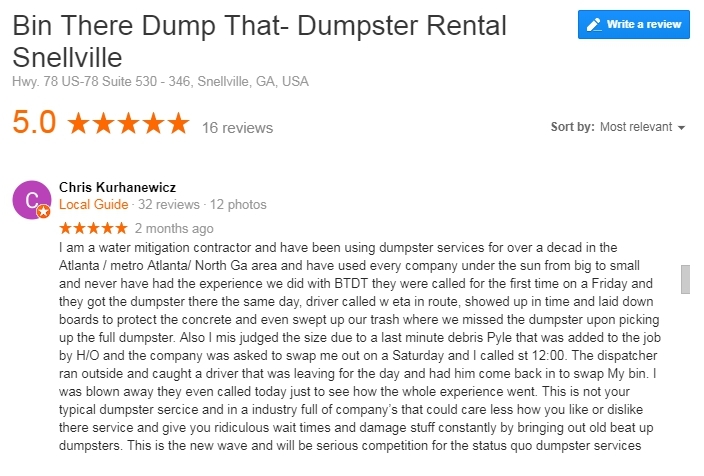 He had never seen a dumpster rental company do this before – for us it was just another standard feature of our service. There was one other incident that really sold him on recommending Bin There Dump That to other contractors. As we mentioned, this contractor rented his dumpster on a Friday. On Saturday morning, he realized he’d made a miscalculation because of some last minute debris – the dumpster he’d ordered was too small for the project. By the time he realized the issue it was noon on Saturday. He called up our local franchise and was surprised not only to get through to a dispatcher, but that he was actually quite helpful. A Dumpster Consultant was able to just catch the last driver in time before he headed for home. The bin was swapped that same day and the project was completed smoothly. In his own words, he was “blown away” by this level of customer service. This was a contractor that appreciated the value of good customer service and when our representative followed up with a phone call to ensure he was satisfied with the experience it cemented his positive opinion. In an industry that it’s fair to say, he viewed with a bit of disdain, Bin There Dump That stood out as an example of what he expected from a dumpster company. In reviewing these two different customer experiences what we found was that all customers are looking for the same things. It doesn’t matter whether you’re a homeowner or a general contractor – you want good customer service and you want a consistent experience through the whole process. The experience these two clients had when working with Bin There Dump That matches feedback we’ve received from other clients. They love our consistent and positive customer service. If you receive this treatment as a customer renting a dumpster, your experience should be a pleasant one!